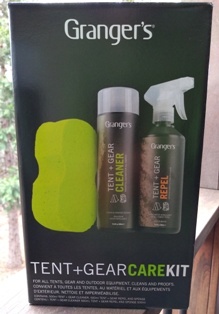 The Grangers Tent + Gear Care Kit is a complete gear care system for outdoor gear. The kit consists of a bottle of Tent + Gear Cleaner, a spray bottle of Tent + Gear Repel and a sponge. 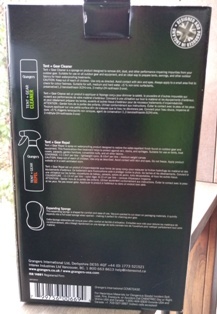 The cleaner is designed to clean outdoor gear (even outdoor furniture) to restore its water repellency and remove odors. The repel is the next step which is sprayed on to clean gear to add water repellency without being detrimental to breathability. A sponge is included to make the job even easier. Grangers is a bluesign� system partner which means that they care about the environment. The bluesign� system checks the environmentally-aware credentials of an entire production chain, resulting in a product completely free from harmful substances and processes. The product seems to be as-advertised on the website. I plan to use it on my tent and backpack prior to my next trip in a few weeks. I'll also wash up my winter tent in preparation for a Spring snowshoe overnight. Then I should be able to report back on how the Care Kit works to protect me and my gear in rain (hopefully I'll encounter rain). I'm curious whether the Repel product leaves any residue which would tend to attract dirt and grime. I like that a sponge is included so that I can have a fresh one dedicated to my gear rather than searching for a questionable sponge in the garage or having to run out and buy a new one. The packaging of the sponge is cool in that it is compressed down quite small for fitting inside the box. Of course, it will expand once it gets wet and become a normal sponge size. I love that Grangers is environmentally conscious. Especially with cleaning products, I find it difficult to find something that is safe yet effective. Unlike other cleaners and care products, I don't have to wear gloves while using Grangers. That makes it easier to use and provides peace-of-mind that I'm not harming myself while caring for my gear. Instructions say to wet the fabric then dissolve 2 capfuls of cleaner into 5L (5.3 qt) of water. Then I would use this solution with the included sponge or soft brush to wipe off my gear. After cleaning my gear and while it is still wet, I would spray the Repel product on evenly. Then I need to wait for 2-3 minutes and remove any excess with a damp sponge or cloth. 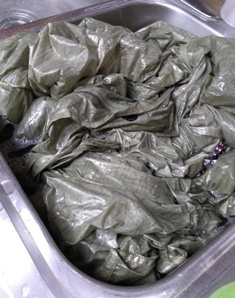 Lastly, I am to allow the fabric to completely dry before packing it away. The weather this week calls for warmth and sunshine so it should be a good time to get some cleaning done! 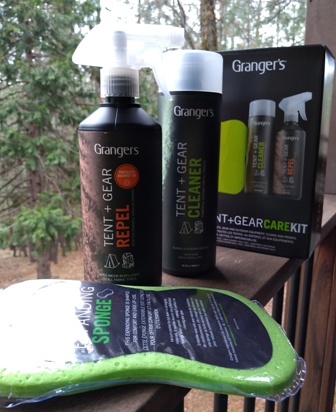 The Grangers Tent + Gear Care Kit is a complete system for cleaning and restoring water repellency to outdoor gear like tents and backpacks. Will residue attract dirt and grime? I treated my tent, backpack and sleeping pad prior to the spring backpacking season. I then used that gear on an extended trip to the Southwest. Based on the instructions that say to pour 100 ml/3.4 oz (two capfuls) into 5L (5.3 qt) of water, I had assumed that with a 500ml (16.9 oz) bottle that I would thus get five washings. Apparently either the instructions or my assumption is mistaken because as it turns out, two capfuls is actually equal to nearly double that. So, I ended up getting between five and six capfuls total out of the bottle. This means that I did three separate washings. In the first one, I washed my tent and rainfly. In the second, I washed my double-wide sleeping pad and in the third, I washed two backpacks. I first washed my tent which is less than a year old but had spent almost 50 nights out prior to washing. I rinsed both the tent and the rainfly separately. Then I set up the tent with its poles and prepared the 5L (5.3 qt) of water with two capfuls of cleaner. The cleaner was clear with no color and just a slight fresh aroma. Pouring it into the water, it sudsed very slightly. The instructions say to rub the areas needing treatment with the sponge, so I began by following that advice. Using the provided sponge, I wiped the tent on all sides multiple times and saw visible dirt on the sponge every time. Each time that I rinsed it out in the cleaning solution, there was more sudsing. 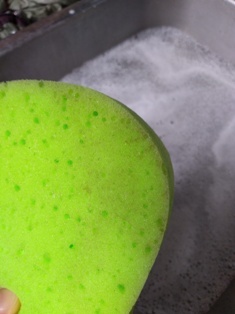 The sponge seemed to hold the cleaner and sudsed up upon wringing. After many (nearly a dozen) passes over the entire tent with the sponge, I was still seeing dirt. So, I decided that the tent was way too dirty to 'spot clean' according to the instructions. So, I doused it and the rainfly in the cleaning solution. Now the dirt came off! The solution was filthy. I rinsed both the tent and rainfly until no more suds appeared. 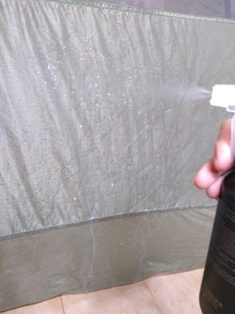 Then I set up the wet tent again and sprayed the outside of it with the Repel product. The instructions say to spray from a distance of 6 in (15 cm) but this seemed to be too close to get an even spray so I was about twice as far away. The sprayer has a 'stream' and 'spray' setting so I used the spray setting. I sprayed all surfaces (except the tent mesh) in an even spray and let it sit for a few minutes before wiping off the excess with a damp sponge. Then I allowed the tent to completely dry upside down. The excess spray pooled in the low spots as a white liquid so I wiped it away multiple times as it collected. Lastly, I laid out the wet rainfly atop my nearly dry tent and sprayed it on the outside with the Repel product, sponged off the excess and left it to dry. The next morning, both tent and fly were completely dry. I didn't notice any residue or white spots. The tent and fly just looked brand new. 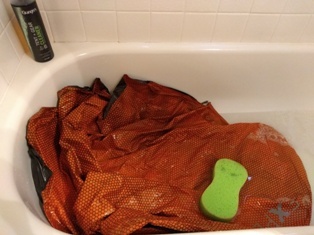 In the second washing, I decided to wash my double-wide sleeping pad. I didn't need to treat the pad with Repel since it isn't exposed to rain. But it certainly needed a good cleaning after last year's outings. The pad was less than a year old but had 45 nights of use prior to washing. Based on my experience with washing the tent, I figured that the pad was much too dirty to just spot clean with the sponge. So, I wet the pad completely in a bathtub. Then I created the wash solution using two capfuls of cleaner in the tub. Leaving the wet pad in the tub, I wiped it completely using the sponge in cleaning solution and then repeated. Lastly, I rinsed the pad well and left it hang to dry. For the third and final washing, I washed two backpacks together in one 'load'. One pack was less than a year old but had nearly 60 days of use prior to washing while the other was three years old with about twice the amount of use. I decided to wash two backpacks in the same cleaning water since that was the end of the Tent & Gear Cleaner. Again, I poured two capfuls of cleaner into my bathtub water which used up all of the cleaner. I washed the packs by dousing, sponging and soaking. They were filthy. Then I rinsed them well and applied the Repel by spraying all sides as evenly as possible. The white protectant pooled in the lower areas which I wiped multiple times while the packs were drying. The tent fly beaded up while I was washing and treating it, so I wasn't sure how much the treatment was adding. However, after treating, I could see some areas that had a slightly different appearance as if they were wetted out (although the fly was dry). Anyway, I did see rain during my test and the fly beaded up like crazy with certainly no issues with keeping the rain out. I didn't notice the same beading up while washing the tent body, so I suspect that the tent floor gained water resistance with the treatment. 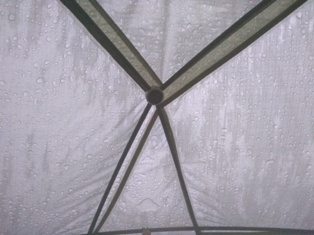 I did notice much more condensation than usual on the underside of the tent fly in the mornings after camping. I was surprised at this because we were in the desert. 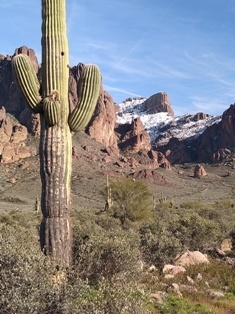 But I'm not sure if the condensation was due to unusually wet desert conditions this Spring or if the Repel product affected the breathability. There is really no way to know for sure. We like to use a quilt for sleeping so that means that we are lying directly on the sleeping pad. I didn't notice any difference after washing with the Grangers product. The pad didn't have any stickiness, residue or other change from the washing...other than being very clean! The backpacks didn't experience much rain except a slight sprinkle on one of the days. So, I wasn't able to assess whether they were more waterproof than usual. I don't rely on my backpack to be waterproof anyway since I carry critical gear in dry sacks inside my pack. But, I did notice that they water beaded up more than usual so the Repel did add to their water resistance. I didn't notice any tendency for any of my gear to attract dirt or grime due to any residue from either of the products. Overall, I like the Tent and Gear Cleaner very much. It was easy to use and seemed to do a tremendous job at cleaning everything. I'm more on the fence about the Repel product since it seemed to change the appearance of my rain fly and possibly increased the amount of condensation I saw. Did the Repel product reduce the breathability of my tent? This concludes my Long-Term Report and this test series. Thanks to Grangers and BackpackGearTest.org for the opportunity to test out this complete care kit.